Bulk SMS software professional allows you send group text messages from PC using Windows as well as GSM technology based mobile phone. Mobile messaging program delivers alerts, events, standard messages and notification across the world. 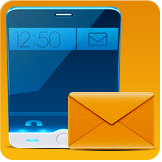 Bulk SMS software for GSM mobile phone sends unlimited text messages, group SMS in different languages over worldwide location from computer using GSM mobile phone without requiring any internet connection. Bulk SMS software for Windows phone sends thousand of text messages instantly across the world. SMS gateway program delivers promotional campaigns, job alerts, important events and other personal SMS from PC using Windows based cell phone. Bulk SMS software for pocket PC devices sends group text SMS simultaneously from Pocket PC devices to single or numbers of mobile users. Pocket PC to mobile SMS messaging apps saves sent text messages details to templates for future references. Bulk SMS software bundle pack includes bulk SMS software professional and bulk SMS software for pocket PC devices. You can purchase bulk SMS software bundle pack at cost effective prize to send group SMS instantly.